Hi, everybody! I´m just passing around to show a technique to easily intercept JAX-WS web services messages. It is a quick piece of knowledge, and it is based on three simple steps. That´s right. First of all, be aware that I tested it with EJB´s services, and I don´t know if it works with other types of exposed web services. Also, note that I present here a solution that works with annotated web services. Pretty easy, right? I´m taking for granted that the interceptor and the configuration file are pretty self-explanatory, but if you have any doubts, don´t hesitate asking me, OK? Disclaimer: this pattern does not refer to Oracle´s SOA Suite 11g Mediator, nor any Thomas Erl´s Patterns (although it looks like the implementation of pieces of some of his patterns). So, give me a brief description on what it is about. People who are used to work with SOA are, usually, used to work with ESB´s – I say “ESB´s”, plural, to mean different kinds from different vendors of ESB – and BPEL. ESB´s are often used to justify decoupling of clients from service providers. I think it is great, but people usually forget that ESB´s, as long as they are too decoupled from the system, do not provide so much advantages as it should. So, usually, ESB´s are a layer of extra complexity to systems (the exception are some odd situations that don´t fit the usual description). Sometimes, you need some piece of software that is more intimate to the system, that can interact in an easier way to the system (like some easy way to audit calls, log them, place warns on whether systems are responding or not – therefore avoiding issues on being overloaded due to slow responsiveness of external services -, etc.). So, thinking about it, I developed this pattern. Explain it better, what is it about? People need to be in control of their applications. People should be in control of their applications. Usually, that´s not what happens to a SOA-based app, because we rely too much on external tools and forget that good things may be done at home, too. So, you don´t need to use a service composition to audit external services I/O, for example. If you would do so by today´s standards, you would build a service to do the auditing, then group the external service and the audit service into one piece of service composition, then offer the composition´s contract to the client… too much work. You should not build separate services unless you need them as services (after all, SOA is about getting the IT to work along with the business, right? So, it should not try to add extra pieces of complexity, like one more service, to the business, right? ); so, you should approach the problem with another solution, like intercepting the messages according to your programming language way of doing so. So, my pattern is about intercepting outgoing messages / incoming responses by building transparent, language-friendly units, in a manner that, if you need extra capabilities but do not want (or do not need) to build extra services, you should consider applying this pattern. //Create the dispatcher, given the data. //You may add any extra logic here. Just to remind the reader, I would like to mention that this technique has been shown here. 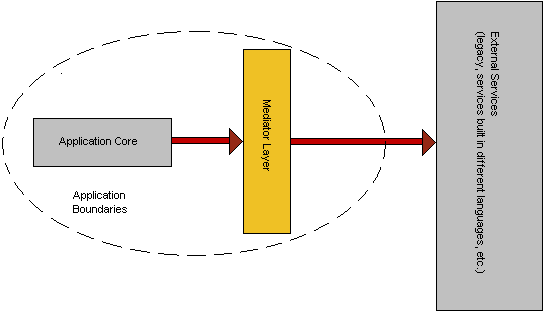 I have shown here a design pattern that I call Services Mediator. Basically, it is the same that an Enterprise Service Bus does, but with the difference that it must be implemented in the same language that the application uses, providing, then, more control to the application programmer. So, at any time the services need some business logic, but does not necessarily need to use services to do so, the programmer may add this logic inside the services shell. Please note that this refers to a WEB-INF directory. So, as you may have guessed by now, it MUST run on a web project (.war). Other forms of java files, like .jar or .ear are unable to run this code. The URL pattern, here, is the address where our web service will answer requests and will provide it´s contract. Having reached this point so far, we need to place JAX-WS lib´s on the common library directory under Tomcat (for application servers like JBoss, you may skip this step). And that´s all! Accessing the address http://localhost:8080/WebServices/provider?wsdl has shown me the WSDL that I quoted above, how about you? You may check the code that I used here at the downloads section. Today, I would like to say just a few words on ESB´s. As you may know, I´m a Java developer, but I work specifically with SOA (Service-Oriented Architectures) and Service-Oriented Computing in general. So, my day-by-day tools include not only those of Java, but some known as belonging to SOA stack, like BPM, BPEL and ESB. ESB is an acronym for Enterprise Service Bus. 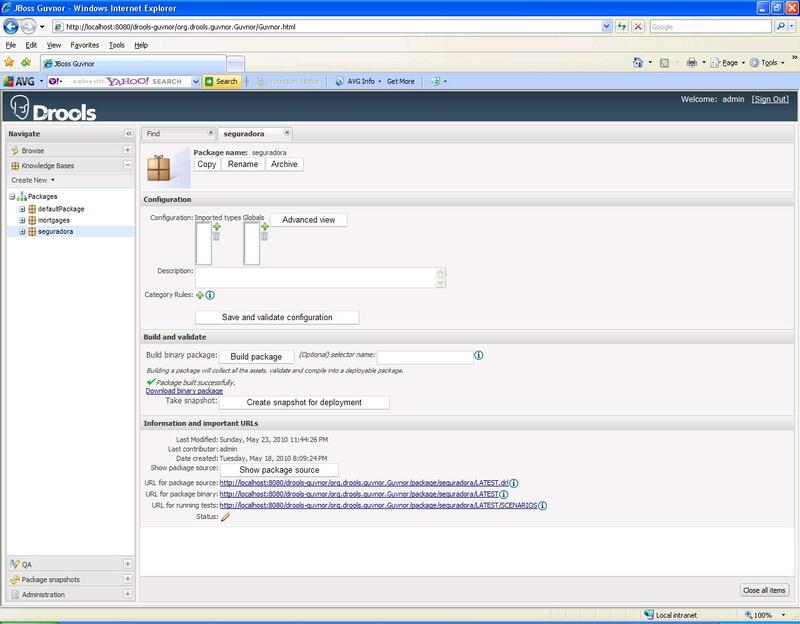 It is a tool designed to provide flexibility to SOA, and refers often to the Message Broker pattern. It´s use often provides flexibility to SOA, but, indeed, adds more complexity to the overall architecture. The last quoted capability is so important that it deserves its own explanation: the structure of a concrete service contract includes a section where the service address is specified. But, suppose that I can not guarantee that this address will always be the same. If this service address changes, all clients will be impacted, and, for sure, that is not what we expect when implementing SOA. Also, suppose that a service model changes (which, of course, is highly undesirable if someone wants to succeed when adopting SOA, but it may happen in the real world). The ESB may completely override service contracts, routing messages to the real implementation and even transforming messages so the can be compliant to the real implementation (just a note here: transformations, in SOA, are very undesirable as they decrease the system performance, but, still, they may be neccessary). Suppose that you want a given service to be secure. This service needs muthual authentication through certificates, but still, it needs to be very, very, very (very!) fast, as you cannot tolerate it to delay too much. Now, consider that this same service is going to be consumed both from the inside of your application (still being used as a service) and from outside. The outside requests must be handled in a secure way in opposite to the inside ones. Then, you can place the whole security stuff in the ESB, as it does the rest. This approach has a bonus, which is that you are sppliting processing need through layers and machines, as the ESB machine processes the security layer and the service layer machine processes the logic itself (along with some XML parsing, for both of them). So, the “split” and “regroup” has been mentioned in the topic of services virtualization, as the ability to “rewrite” service contracts. Message filtering is in the sense that, generally, the ESB transcends the web services capabilities and that it can filter messages. A practical example of this filtering is that, suppose that you set in place a query service and that a malicious user place a query that intends to cause overflow on the server, making it to crash. The ESB can cut off the request and/or the response, limiting, for example, the size of the message, allowing to pass only messages below 8 megabytes. An ESB can enable high availability / load balancing capabilities for web services, increasing the failure recovery hability of the SOA application. Just in case you ask: this is an example of why one of the services design principles is to make statelss services. So, if any of you ask me how to make a stateful service, it is more likely that I answer you something like “you don´t need this” rather than “do x, y, and z”. There are lots of SOA (and Enterprise Integration in general) patterns that an ESB implements. I would be here for at least a couple of hours writing about them, but I would be repeating what is already catalogued, and you can check these patterns at SOAPatterns.org website. A good ESB must comply with a few standards, as this is one of the major goals of SOA. The WS-* specs are a couple of specs to address some common issues related to web services, like distributed transactions (WS-Transaction), dynamic addressing (WS-Addressing) and security (WS-Security), just to mention a few. You can check a more complete list of specifications here. So, what am I waiting for? I want to use an ESB!! Hold on. There are lots and lots of discussions on whether it is good or not to place an ESB over a SOA architecture, and how far the benefits go and how far the headaches go. I would only be awakening the flame war of “to ESB or not to ESB” by exposing my opinion here, so I would like to keep it for myself. If you want to check it for yourself, have a look at this google query. Hi, boys and girls! First of all, I would like to say that, yes, this blog´s posts are gonna be all written in English, so they can affect more people around the world. That said, I also would like to say that, although the language has changed, the content is gonna be the same, so I will write and, where it fits, make a critical analysis on the solution. Web services that use certificates are specially tough to invoke. Along with the complexity that involves almost everything that concern to web services, it also involves the complexity that involves almost everything that concerns to secure communication over the web. So, putting these problems together may give a very strong headache to whoever that wishes to invoke secure web services in Java. Invoking services in a secure way is relatively easy when they do not use more than one certificate in the same VM. But, when it involves more than one certificate, it may be useful to give aliases to the certificates, and to have the ability to select between these certificates in runtime. Also, it may be useful even to change from keystore to keystore in runtime. So, the intent, here, is to provide a simple solution to this problem. What am I gonna need? First, you need to assemble a key store and a trust store. I´m not gonna show how to do it here; however, the reader may google it (using a query like this one) to find out how to do it. Second, you must (obviously) have the contract for the service to be invoked. Be warned that, probably, you won´t be able to access it directly, because it will be protected by HTTPS. So, get in touch with the responsibles for the service that you want to invoke. Third, and finally, remember to read carefully the analysis that I am providing at the end of the text (the penalty for not accomplishing this requirement may be an incompatibility between environments). I´m aware of the requirements, let´s go! //Init a key store with the given file. //causing the handshake to fail). //Load a dispatcher with the givend data. //Be aware: don´t use the com.sun.xml.internal.ws.developer.JAXWSProperties interface instead !!!! Here, I create the dispatch to invoke the service. All I have to do, now, is to create a SOAPMessage and use the invoke method, on the Dispatch interface, to invoke the web service in a secure way. If it interests the reader, you may improve the code to use some sort of JAXB piece to create a SOAPMessage from an object. The reader must be aware that JAXWSProperties is part of a Sun library and, so, may not work with some application servers and/or Virtual Machine implementations. I tested it using Sun´s JDK 1.6.0_20, with a JBoss AS 5 (which already has the JAR that contains JAXWSProperties). Also, be aware that the solution presented here is not easy to use, and the reader may be interested in creating some sort of Object-to-SOAPMessage translator (maybe using Reflections?). Finally, be sure that speed is not critical, because this code is going to generate a new SSLSocketFactory (including a IO call) to every call, so it may be more interesting to use some kind of cache (of the SSLSocketFactory), in order not to create a new one at every call, but to reuse them. In this final part of the tutorial, I will present how to deploy rules to Guvnor. However, here is a sign of a problem with this approach: even the present version of Guvnor, the build and create a package / snapshot can not be done in an automated manner using this approach (so, it prevents the immediate consumption of these rules ). I´m not sure if a can expose my solution to this problem on this blog (due to a number of restrictions). However, if I have any appeal of the community I will be happy to check these constraints and if there are no issues, I may publish it here. * @param rule Presumably, a POJO that contains data from the the rule to be generated. * This method will retrieve a custom model of what will happen inside a rule´s body. * Remeber that IAction is an interface, so, evaluate the possible implementations. //In my case, the method will retrieve a representation of setting a value onto the fact. FactPattern class represents the fact. In the constructor of the same, will the fact that the name will be used. In boundName attribute, you create a variable to perform the assignment. addConstraint are added to the clauses of fact. attributes rhs and lhs, class RuleModel are added, respectively, the definition of fact and the definition of the consequences. This method will then return the representation of the rule as String. I won´t go into details here of how to accomplish the definition of fact, as unknown, until now, automated way of creating this in the body’s own rule. Also, since I went into detail about how the syntax for defining the first part of this tutorial, then left to the reader the automated generation ddo fact. Once the generation is made, just synchronize it with the model presented in the first part of this tutorial and ready, we have the rule generation and creation in Guvnor presented. Thereby closing the tutorial, step to the critical analysis of the solution (as I hope to do every time I post a tutorial here). One of the most serious problems with this solution was the fact that you were referred from the party itself, ie the impossibility of creating a snapshot to enable the immediate consumption of the rules. This can cause major problems for those who want immediate solution to the problem (although, as already mentioned, I have the solution to this problem and hope to submit as soon as possible for both the community and for the team responsible for the Guvnor). Another problem, too, is the creation of a sequence of rules. You can create sequences through the implementation of the rules attribute salience , that can be embedded in the body of rules, and by creating flows rule . However, both mechanisms add problems when it made an automatic creation of new rules, which ultimately makes the scheme impractical. And finally, citing the problems I cite also the management of these rules is problematic when done by Guvnor, recommended, so some sort of maintaining the route database. This creates a different problem when the use of rules is achieved, because the consumer of the rules is optimized to work with URLs or files, or if consumption of rules is done via the database, it is necessary to create a REST API own (or at least a Servlet that responds by GET method). Moreover, the consumer rules only works with the built package, which can generate an additional problem generation. That said, it must be noted that the control of an application via API rules is extremely powerful, because besides being a flexible mechanism (from the standpoint of the system operator) is also relatively easy to manage. Furthermore, a mechanism is also extremely fast (in benchmarks that I made between two different machines and after the creation of consumer rules, the meter accused times between 1 and 10 msec). Therefore, it is the burden of developers and / or the architect of an application to analyze the cost / benefit of this. Just leave here a reminder that the problems I mentioned occur in development time, and advantages occur with the application already put into production. That is, I believe that the benefits always overwhelm the problems, either from or in any other Drools Rules Engine.